The Downtown Denver Partnership last week released the results of its commuter survey, an annual exploration of how people get to and from their workplaces downtown. DDP polled 5,740 commuters, which is almost 5 percent of all downtown workers. A plurality of people polled, about 41 percent, said they commute via transit. That’s less than the 44 percent share in 2013. Almost as many people, about 39 percent, said they drive solo to work. Compare those figures with Seattle, where 45 percent of people take transit, and just 31 percent of people commute downtown by driving alone. So what does it all mean? 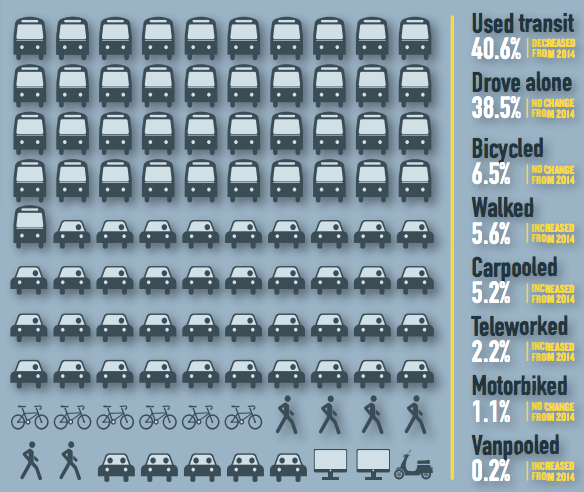 Streetsblog Denver analyzed the numbers and spoke with DDP’s Director of Downtown Environment Aylene McCallum to glean what some of the figures say about the choices people are making, and why they make them. People who live within five miles of downtown are more likely to drive than use RTD’s bus or rail service. The further people live from downtown, the more likely they are to take transit. These stats make sense when you account for the investments in regional rail and bus service over the last decade through the voter-approved FasTracks expansion. What makes transit so unattractive, even when riders only need to go a short distance? Maybe it’s the infrequent service on many bus routes. Maybe it’s the cumbersome, outdated fare technology that makes buying tickets and boarding a hassle. Maybe it’s because RTD can’t relay arrival and departure information in real time. “There hasn’t been a huge focus by RTD on improving local services, because they’ve been working on FasTracks,” McCallum says. “If you look at what RTD is doing in the next couple of years, it is almost entirely focused outside of the city of Denver. People who live within five miles of downtown are three times more likely to bike and 3.5 times more likely to walk to work than the general population, according to the survey. The significant increase in walking probably goes hand in hand with the fast-rising walkable developments in and around the downtown core. The share of bike commuters dropped .01 percent — a number that DDP President and CEO Tami Door guaranteed would change with the proliferation of more protected bike lanes like those on Arapahoe and Lawrence. If you extrapolate the numbers from the latest commuter survey, about 46,500 workers drive in and out of downtown daily. The downtown area has about 45,000 public parking spaces between garages and on-street spaces, according to DDP’s parking inventory, which doesn’t include any private lots and garages. DDP’s main prerogative is economic development, and McCallum says a lot of money being spent to drive and park downtown could do more for the local economy if it were spent on other services and goods. Conservatively, car commuters are spending tens of millions of dollars each year to store their vehicles downtown. Many commuters who use transit also have monthly passes, which probably minimizes the “fare technology” argument. 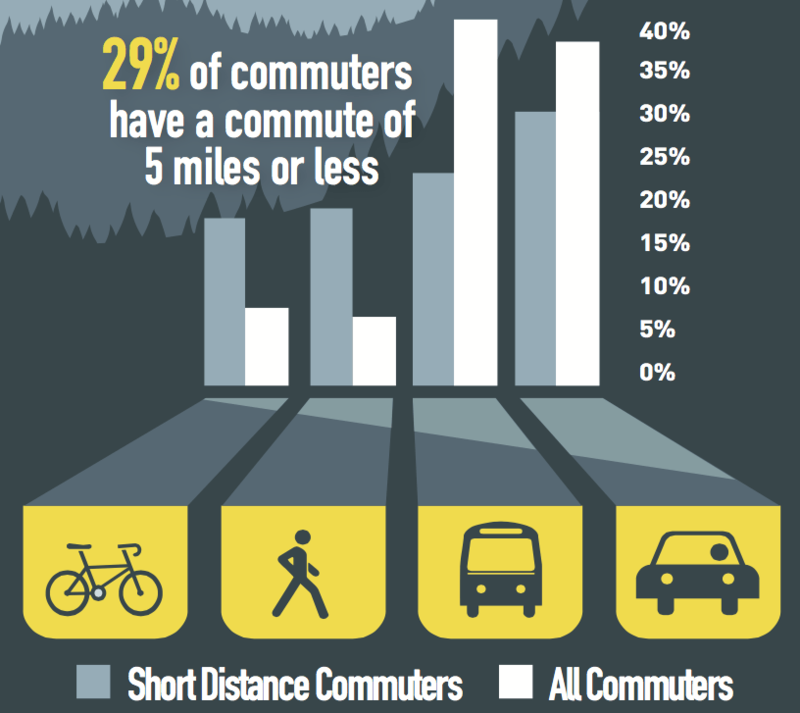 I’ll agree that the closer you are, the more sense it makes to just bike or walk . . . except when the snow flies, and riding the 15 gets even more “interesting”! I’ll say the outdated fare system is a deterrent for me. My family life does not allow me to take transit every day ( transit is still way slower than driving in my case. Transit is only for my relaxation and chance to exercise through walking). So a monthly pass does not make sense for me and my employer does not subsidies one for me. I have stacks of ticket books that are regional fare denominations, but my current commute option does not need that much fare. I could just over pay or make a special trip during my workday to exchange the tickets at Union Station. Or go through a cumbersome mail in process. Would be much better to just have all those funds on a card that I can use as needed. Having traveled to other cities with pay as you go card systems is way easier. Also those same cities had their real time transit geolocation information tied into smart phone apps like Moovit and Transit. Here in Denver with RTD you’re in the technological dark. Or, you could just have a stash of cash, small change, and dump whatever is needed, when needed, into the fare box, like most people have done for decades! Infrequent users spend/waste more time chasing “discounts” than they “save” just paying the “full” fare. Like you alluded to, your time has value . . .